During the years preceding the siege of Paris and the Commune (1870-1871), the workers trade unions in the French capital passed from the ideological influence of the Proudhonists to that of the anti-authoritarian collectivists of the International, including Eugène Varlin, martyred in May 1871, their inspirational and intellectual mentor. During the repression of the entire advanced sector of the movement, the trade unions vegetated under the tutelage of men from the republican parties, who were more or less conservatives. After 1876, with socialism re-emerging, the socialist leaders took over the leading positions in the trade unions. The anarchists, meanwhile, starting in the 1880s, dominated a few small, very militant trade unions, but they had no contacts with the large mass of moderate trade unions. Emile Pouget—who was the animating spirit of the employees in retail trade, whose trade union dated back to 1879, and of the anarchist activities among the unemployed, in his Père Peinard—on the occasion of the great persecutions in Paris which threw the anarchist groups into disorder advised the comrades to enter the trade unions in order to combat their subjugation by the politicians. This was at the beginning of 1894, and he had observed how a protest against the politicians had arisen in the trade unions; this happened as the result of the rise of the idea of the general strike among the workers, around 1890 (on the First of May), when their faith in politicians was shattered by the scandals in the political milieu and by the vehement anarchist propaganda of the time, as well as by the rise of antiparliamentary and economic struggle tendencies in the most advanced fraction of the Possibilists, the party led by Jean Alleusane, a communard who had been deported and then had been repatriated and became the director of a socialist press. But the person who was most interested in the trade unions, beginning in 1892, came from the socialist camp, and in 1893 became an intransigent anarcho-communist: Fernand Pelloutier. Due to his activity between 1893 and 1900, and to that of Pouget, Griffuelhes, Yvetot and a very small number of other people from 1900 to 1908, French syndicalism entered a steeply ascending course for 15 years, and became an emancipatory factor which contributed the force and the form of the social revolution that seemed to be both imminent and unstoppable. These hopes were frustrated by 1909, 1908 or even 1906, for the most insightful observers, but Pelloutier, at the end of his short life, saw the movement rising in 1901, and had he lived longer, he might have been able to prevent it from rising so precipitously, since the catastrophes which soon followed were just as great and just as rapid. Fernand Pelloutier, born in Paris on October 1, 1867, with family roots in the west of France, in the cities of Le Havre and Saint-Nazaire, a well-educated young man without means, reacted energetically against the conservative environment of his youth, and was attracted to the local radical journalism of the cities of the west, but he became a socialist. He would never break with socialist politics, but undertook serious studies of Proudhon, among others, and became interested in the life of the workers in their economic struggles, which was the last thing to concern the socialist politicians, who only cared about their votes. Even earlier, in 1889, in a radical broadsheet, he supported the candidacy of Aristide Briand, at that time an unknown and uncompromised lawyer, who was seeking to make his start in politics. Pelloutier, without harboring any illusions, gave him his full intellectual support, while it seemed of use for his career. Briand grasped the possibilities for political advancement which electoral socialism offered to its deputies, but the highest positions were occupied by incumbents. Having no likelihood at all at that time of ever being one of them, he remained independent and said things that the other socialists, for a thousand electoral reasons, never dared to say, and he also drew the attention of the socialists with audacity and exploits that the others never dared to imitate. Pelloutier had some fun pulling Briand’s strings. Thus, when Pelloutier, at a socialist congress held in Tours from September 3-5, 1892, presented the motion for a comprehensive plan for the general strike, which was elaborated for the international Congress of 1893, Aristide Briand, attending the Guesdist Congress, presented the same proposal on September 14, and at the Congress of the Trade Union Federation, held from September 19-23 in Marseilles, he delivered an impressive panegyric on the general strike. This speech—which must not be confused with a similar speech delivered in September of 1899 in Paris and which is quite watered-down in its pamphlet version—caused a sensation in the socialist world and was the first step in Briand’s rise to fame which, henceforth, would have no need of Pelloutier. In February of 1893, Pelloutier left the provinces for Paris, where Agustin Hamon and Gabriel De LaSalle, fellow westerners, formed the poles for his first orientation. Hamon had been compiling annual statistics relating to the social question, and Pelloutier collaborated with him on this project. The data they methodically collected examined the psychology of the professional soldier and, later, that of the anarchist socialist. According to subsequent works which have described anarchist theory and tactics, such as the book by Dr. Eltzbacher, these moderate and impartial studies exercised a most salutary influence in opposition to the horrible Lambrosian ideas which were dominant at that time, and which, besides being reactionary and mean-spirited, were fundamentally superficial and misinformed. LaSalle was a poet who published the literary review L’Art Social—between November 1891 and February 1894—a journal for enlightened minds. Thus, Pelloutier became fully acquainted with the anarchist press through Hamon and, as Hamon has related, this led him to a passionate anti-Guesdism (anti-Marxism); since he was an organizer, he tried to replace the central statist organization with a federalist organization, and the result was syndicalism. Pelloutier may have also been familiar with Kropotkin’s anarchist communism, fashionable at that time in his milieu, as well as the collectivism of the International, via the proceedings of the Congresses from 1867-1869, the Marxist intrigue in that organization and the economic conception of the mission of the workers in social struggles, which the Memoires of the Jura Federation, written by J. Guillaume, together with Bakunin’s 1869 propaganda works, published in 1873, had popularized. He might even have known about the mission of the trade unions and their coordinating body: the Federal Chamber of Workers Societies, formed in October 1869, when Varlin, Pindy and so many other future militants of the Commune were active within the trade unions, and he could have completed his study of Proudhon. With the aid of all these impressions he was able to trace the outlines, with his clear imagination, of a renewal of the vigor of the local trade union bodies, that is, to inspire the local trade unions which had combined under the influence of Varlin, with the ideas of libertarian communism and the cultural aspirations championed by L’Art Social, to federate these vast institutions, as Proudhon had advocated, and to make them take an increasingly more resolute stand against Statism and the bourgeoisie which, deprived of their collaboration, would be smashed to pieces. Such was, in a word, Pelloutier’s social ideal, and his historical accomplishment was not to have invented or discovered anything—all the component parts of his vision were already in existence and were accessible to anyone willing to devote a few hours to the study of well-known publications—nor was it anything new, he merely filled the old framework with more modern libertarian communist concepts—Kropotkin and many others had already laid the foundations—his historical mission consisted solely in his will to set to work to realize, starting immediately, what could lead to the true union of those forces determined to begin the great social struggle, on foundations which were barely discernable in 1869-1870 and were completely blocked after 1870 by politics and reformism. In early 1894 Pelloutier was the delegate of the Saint-Nazaire Bourse du Travail to the National Federation of Bourses, and in June of 1895 he was named Secretary of the Federation, which then held its Congress in Nîmes. What was the state of the French organizations at that time? In October 1886, the National Federation of Trade Unions was founded in Lyon; in that same year, the Bourses du Travail of Paris and Nîmes were also founded. The French Bourses federated in February of 1892, at Saint-Etienne. In July of 1893, a general Congress held in Paris issued the following directives to the trade unions: first, join the Bourses and their Federation, and second, form industrial federations which would, together with those of other countries, form international federations, a double organizational framework which exactly corresponds with the proposal made by Anselmo Lorenzo, in the name of the Valencia Conference of the Spanish section of the International in September 1871, at the London Conference later that same month, and the Conference included the project in its files (which I have published for the first time in Documentos inéditos sobre la Internacional y la Alianza en España, in 1930, pp. 50-53). But cooperation was far from being established between the Bourses and the federations. The latter were the backward element, the fief of Guesdist politicians, and the Bourses were the vanguard element, inspired by communalist sentiments: an inevitable state of affairs, since the men of one locality, who know one another, develop their social sentiment in a manner quite unlike the scattered men of the industrial federations, who do not know on another in their various localities, and the particular interest of the corporative trade union grouping divides the collective interests of its local environment. The mentality of the federations was therefore fixated on everyday questions relating to the various trades, while the expansive and generous mentality of those men who were resolved upon the struggle for the future was formed in the Bourses, a prosaic and ill-chosen term, but one that has been consecrated by tradition in France. 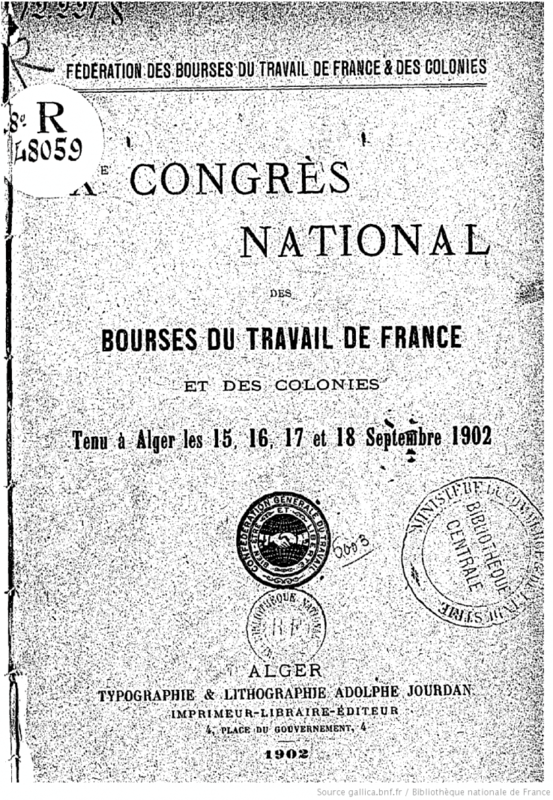 In September 1894, the two elements held a joint Congress at Nantes; it was attended by 21 Bourses (776 trade unions), 30 federations (682 trade unions), and 204 trade unions which sent their own delegates. Pelloutier and Briand as well as Guesde and Lafargue were there, and the opponents of the general strike were defeated, 67 votes to 37 votes, and then withdrew from the Congress. In 1895, at the Congress of Limoges, the General Confederation of Labor was founded, an organization with a rather nominal existence at that time, since Pouget himself has written concerning its first years (1895-1900): “During the following five years, the CGT remained in an embryonic state. Its actions amounted to almost nothing and its greatest efforts were employed in an unfortunate conflict which had arisen between the CGT and the Federation of the Bourses du Travail. The latter organization, which was then autonomous, concentrated all the revolutionary life of the trade unions, while the CGT assiduously vegetated, since at that time it only included corporativist federations. During this period, the driving force for the orientation of the Confederation was provided by elements which were subsequently to be classified as reformist….” (See The Party of Labor [Le Parti du Travail] 1905). Until the Congress of Toulouse in 1897, one could not detect the slightest improvement, but between then and 1900—the Paris Congress in September—revolutionary elements infiltrated the CGT, so that the Paris Congress reflected their preeminent position, but Pelloutier was by that time an invalid and died in March 1901. His activity in the Bourses, then, was carried out in the face of the hostility of the Confederation and this necessarily also implied the hostility or opposition of numerous trade unions affiliated with the two organizations. Pelloutier spent several years devoted to intensive work as Secretary of the Bourses, against the opposition mentioned above, and also faced other powerful obstacles. The origin of the Bourses du Travail was often a result of the desire of radical municipal governments or local politicians to secure the votes of the workers; they provided the meeting hall and subsidies, which led the trade unions to lose the habit of accounting for their own dues, if they had ever developed such a habit. As a whole, it was a precarious and demoralizing independence. But ways to get by without subsidies were never easy to find, since the condition of being subsidized was not considered to be too onerous or undignified by many people who believed that, as citizens, they had the right to public funds. Pelloutier was very unhappy under this state of affairs, but what could he do, when he was barely tolerated and had so many enemies? His ideas about the general strike are expressed in his first memorial of September 3, 1892; in his historic 1893 essay, The General Strike (La Grève générale), which proves that he was aware of the debates that took place in the International in 1869 and 1873; and in the dialogue What Is the General Strike? (Qu’est-ce que la Grève générale?) (written in collaboration with Henri Girard), published in 1894. The Corporative Organization and Anarchy (L'Organisation corporative et l'Anarchie) appeared in L’Art Social in 1896; The Trade Unions in France was published in 1897; The General Congress of the French Socialist Party (December 3-8, 1899), preceded by a Letter to the Anarchists (Lettre aux anarchistes) (1900); How to Create and Operate a Bourse du Travail (Méthode pour la création et le fonctionnement des Bourses du Travail) (October 1895) and other documents on the organization’s practical affairs; he left a manuscript which was published by his brother Maurice under the title, History of the Bourses du Travail (Histoire des Bourses du travail) (comprising pages 33-171 of a volume published in 1902 which also contains essays on all aspects of his activity by Georges Sorel and Victor Dave, as well as supplementary documents); the monthly journal The Worker of the Two Worlds (L’Ouvrier des deux mondes); he produced The World of Labor under very difficult conditions and sometimes even worked on its typographic composition himself; and he contributed to the People’s Daily Newspaper, an anarchist daily published in 1899 (its principle editors were Sébastian Faure and, later, Pouget). His empirical studies on the life of the workers are collected in The Life of the Workers in France (1900); he assisted Hamon in work on the volume Socialism Today, which was never published; he made many contributions to The New Era, Jean Grave’s weekly, starting on June 26, 1895, and in 1896 contributed an article which presented contemporary trade unionism to the anarchists and responded to criticisms; his speech “The Art of Revolt”, delivered at a conference held on May 30, 1896 (published as a pamphlet by L’Art Social); Bourgeois Anarchy, which was translated and published in Ciencia Social (Barcelona), analyzing the origins of centralism in France during the Revolution of 1793, the despotism of Paris, etc. Such writings demonstrate what he was capable of saying as an observer, when he had the time and when he was not ill. Tuberculosis, however, had ravaged his face when he was a teenager, and during his final years descended to his larynx, taking several more years to kill him. As Secretary of the Bourses du Travail, he received no pay at all, at first; later, he was paid 300, then 600 and finally 1,200 francs per year, an amount that was insufficient to provide for his medical needs, while he also had a wife to support. Sorel, when he became aware of Pelloutier’s poverty, spoke to Jaurès, who could do nothing more than speak to Millerand, who was at that time a Minister in the French government, who appointed Pelloutier to the provisional position of investigator for the Department of Labor, which was an office of the Ministry of Commerce, and Pelloutier, who was then quite ill, accepted the appointment and was paid 1,800 francs for producing reports based on the Department’s statistics. When he attended a Congress for the last time, in September 1900, the Guesdist delegates belabored the issue of his employment with the Ministry of Commerce, and Pelloutier, his collar stained with blood and unable to speak for any period of time without swallowing pieces of ice, had to defend himself against their malevolence. Six months later he was dead, in the clinical sense. This man, whose spirit was directed towards the future, and his will towards the great struggle, needed an immense idealism; he had very serious ideas about the general strike, and for him the Bourses du Travail were the local crucibles of the revolution; an immense idealism was needed to trace the first outlines of the task of separating the trade union militants, little by little, from the municipal councils, local deputies, socialist candidates and the petty wars between socialist organizations, which had persisted year after year since 1880, and which twenty years of efforts to bring about unification had only resulted in failure. Pelloutier could not win this fight; all that was achieved was a glimpse of the ideal that could have been impressed upon the workers’ local activities, if it was exclusively sought and applied unreservedly. Peoples’ Hall, Workers’ Cultural Center, Center for Coordination of the Struggle, each an aspect of the free municipality of the future: the Bourses du Travail were susceptible to being transformed into all these institutions, as Pelloutier’s thought and written word constantly remind us. Yet even in the case where he could see a small portion of his dreams come true, he came up against the ideas and the will of those who wanted to work through the Industrial Federations. If the Federations and the Bourses established a modus vivendi in the years following 1900, this was only made possible by the Bourses being resigned to yield to the Federations. Pelloutier was no longer there; would he have sacrificed all his work, or would he have waged a struggle such as those who staffed the Bourses after his death were incapable of mounting? Neglecting the Bourses and local affairs, those who attained positions of power through the Federations soon implemented a policy oriented towards power, prestige and splendor, staking everything on the one card of the First of May, 1906, and losing that wager, and put on the defensive from that moment on, first against Socialism (Jaurès), then against State repression (Clemenceau), later against reformism (Briand) and thus arrived at the catastrophe of 1908-1909—from the CGT of Pouget and Griffuelhes, to the CGT of Léon Jouhaux. If Pelloutier had lived longer, would he have been able to avert this disaster? It is, it seems to me, more an educational and persuasive parallel which Pelloutier elaborates here, rather than a formal plan, since he professes ignorance concerning all possibilities of the future. He was a man of broad horizons, such as we have seldom seen in our ranks, either before or after his time. His involvement raised the level of trade unionism very high, all at once; his premature death left a very large vacuum. I only saw him in 1896, when he attended the International Congress in London, where he was lively, serious, intelligent and desperately ill, so he seemed to me then. Translated from the Spanish edition of Fernand Pelloutier's History of the Bourses du Travail (Historia de las Bolsas del Trabajo, Zero-Zyx, Madrid, 1978).